I always plan birthday parties for my son at locations outside my home. Some of our guests have allergies to cats (and we have two of them) so I always try to choose a party location that everyone will enjoy. When planning a party outside the home, I always worry that I’ll forget something that I need. 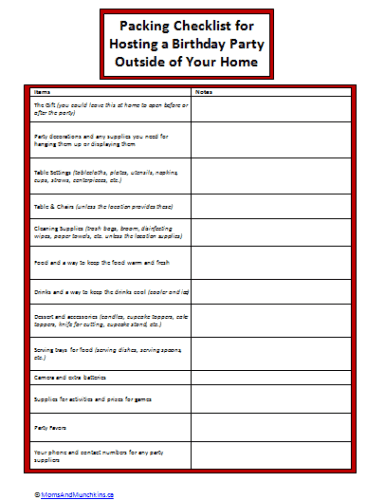 I have a birthday party checklist list that I use to make sure that I don’t forget anything and I’ve created a free one for you to print and use for your next party. If you’re looking for a checklist for planning a birthday party – we have a free printable for that too! When creating your list, keep in mind the time you have for party setup and clean up. You don’t want to bring too many items along if you won’t have time to use them. The Gift – I usually leave gifts from us at home so that my son can open it either before or after the party. There is so much to remember already and it’s nice for us to have a quiet time at home with our son while he opens gifts from us. Decorations – Make a list of all of the decorations you are bringing to the party and the supplies you need to hang up each of these decorations. This list could include double-sided tape, painters tape, ribbon, string, photo frames, etc. Be sure to check with the location for any rules they have on decorations (many places won’t let you use tape on the wall). Be sure to consider all of your decorations when adding the items to your birthday party checklist. Table Settings – Think of everything you’d need to set a table like the tablecloths, plates, utensils, napkins, cups, straws, centerpieces, etc. Be sure to add all of these items to your birthday party checklist. Tables & Chairs – Does your location have tables and chairs for you to use? If not, you’ll need to consider where people will sit and where you’ll set your food. Cleaning Supplies – Does your location provide cleaning supplies for you to use to clean up after the party? These items could include garbage bags, a broom, disinfecting wipes, paper towels, etc. If you need to bring some of your own supplies, be sure to add these to your birthday party checklist. Food – When packing up your food for a party, don’t forget to also include a way to keep the food warm and fresh. Drinks – When packing up your drinks for the party, remember to pack a way to keep them cool (a cooler and ice). Dessert – Think of all the accessories you’ll need for your dessert like a cupcake or cake stand, a knife for cutting, candles, etc.). Trays for Food – How will you display your food at the party? If you need any special serving dishes or spoons, be sure to add these to your birthday party checklist. Camera – Along with the camera, don’t forget an extra pack of batteries. There will be many special moments that you’ll want to capture. Activity Supplies – If you have planned games for the party, be sure you bring along the supplies needed to play the game along with any prizes for the games. Party Favors – If you’ll be sending your guests home with a special treat, remember to add this to your birthday party checklist. Display these in an area close to the entrance to the party so you’ll remember to give guests their gifts when they leave. Phone and Contact Numbers – Don’t forget to bring your phone along with you in case guests are trying to reach you for directions. If you have vendors who are bringing supplies to the party (cake, balloons, etc. ), bring along their phone numbers in case you have to call them from the party. What’s on your birthday party checklist for parties outside the home? Have you ever forgotten an important piece of your party? We love parties and you can see that by the amount of party posts we share! Never miss a new post by following along on Facebook, Twitter, Pinterest and Bloglovin’.